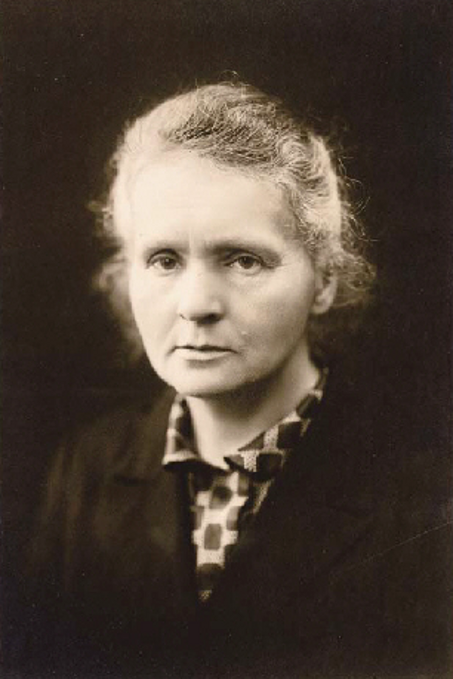 Marie Curie won the Nobel Prize twice. Her daughter also won the Nobel Prize. In other words, she was one kickin' mother. Looking through magazines aimed specifically at women (including most parenting magazines), you might be forgiven for thinking that women have no interest in science or technology. I’m not the demographic these publications are aimed at, of course: I’m not even a parent, much less a woman. Of course there are plenty of magazines consumed by women and men alike, though I can also think of some that are far too guy-focused. That’s not what this is about: for a busy woman who doesn’t have time to read much, women’s magazines and woman-oriented blogs may be a primary outlet. My friend and colleague Elana (with whom I’m collaborating on a research project) is an applied mathematician currently working in mathematical biology. (Here’s an explanation of one aspect of our project.) She is also mother to a young boy, and she writes: “I may actually read the parenting magazines if they had something about advice for science activities and teaching science to kids. They are SOOOOO stupid and boring.” I imagine she’s not along in that sentiment; even people who read the parenting magazines primarily for advice on potty training may also wish for sciency goodness as well. I care deeply about public science education: science is for everyone. When I was planetarium director, obviously a lot of parents brought their kids in for shows, and I made a point of trying to reach both the kids and grown-ups in the crowd. After all, kids are going to ask questions of their mom or dad, and Mom deserves the dignity of knowing and providing those answers herself. You might ask whether woman-oriented magazines and blog networks are the right venue, but I say “why not?” Most of us don’t subscribe to or buy that many magazines; I bet that magazines could increase their subscriptions (and possibly even advertising revenue) if they expanded content, and they probably wouldn’t lose anybody. In fact, Elana reminds me that women’s magazines used to have science sections and puzzles, which have mostly vanished over the years. I can’t imagine anyone saying “I’m not interested in science, so I’ll stop subscribing to a magazine because they run one article per issue about astronomy.” Really the only argument against expanding to include stuff like this is a belief that women are dumb one-dimensional creatures, who care for nothing but home-making. (Emily Willingham on Twitter used the phrase “monolith of maternity”, which is a truly excellent description of that stereotype.) Try that one, editors. See how far insulting the intelligence of your readers gets you. The fracturing of media into niche markets has its good and bad points, but if you think “Mommy” with no interests outside the home is a legitimate market, you relegate a huge section of the world to irrelevance. Not every mom is a scientist, and not every kid with curiosity about the natural world (which is every kid!) will become a scientist. However, to have an educated population, you need to reach everyone, and talk about things that aren’t just how to remove stains, important as that knowledge is to parents and pet owners. Mothers are role models to their children. Mothers are also human beings with their own needs and thirst for knowledge. The sooner we as a society acknowledge all of that, the better off all of us will be. Don’t forget those of us who are women without kids. All too often, “women’s” magazines focus almost completely on marriage, kids, and relationships. Yet, in the US, 50 percent of adults are single, and many are choosing not to have kids. That doesn’t mean we don’t interact with kids, as many have nieces, nephews, cousins, neighbors, etc.. And as a member of an astronomy club, I and my fellow members regularly host groups of kids at our weekly open public nights. My personal favorites in astronomy are Caroline Herschel and Henrietta Leavitt. Neither married nor had kids, but both lived very meaningful and productive lives and contributed much to astronomy. Ironically, Caroline had pockmarks on her face and was unusually short, both due to her having survived two major childhood diseases, leading her mother to try to convince her that the most she could do with her life is be a maid since no one would want to marry her. Thankfully, she listened to her brother William and not to her mom! I was recently in a talk where an interested aunt commentor was trying to figure out science appropriate gifts for her nephlings. Be a scientist, mother, and person who actively looks for this stuff for kids of all ages, I cornered her after the panel to give her some suggestions. Clearly being childless does not mean you are not interested in bringing science to children. (Pre-mommyhood I also cared about bringing science to kids.) Definitely, the women-focused media needs to throw a bit more science in. This is an excellent point. The core of my conceptualization involving mothers, however, was that when they are present, they have been identified as the primary conveyors of education and intellectual perspective to children. If that perspective could be one that folds in science and scientific thinking/intellectual curiosity, that would be useful in raising scientific literacy. I am a mom, and I now work outside the home after staying home for 10 years. When I want information regarding children, education and parenting, I read parenting magazines and general-interest “women’s” magazines. When I want science I read Scientific American and Discover. I do not believe that the lack of “science” articles in “women’s” magazines means that women aren’t getting exposure to such materials. I believe it means there layering within the market. It would probably be helpful if “entry level” science magazines, such as Popular Science marketed a little better to women. I think expecting women’s magazines to expand their topics to science and mathematics is a mistake. I agree that many women have access to scientific information, but not all do. I think Emily Willingham’s post (http://biologyfiles.fieldofscience.com/2011/10/hey-moms-got-science.html) lays out what is at stake much better than I do. The way I think of it is this: if you want to know what (say) the big deal is about dark energy because of the 2011 Nobel Prize, wouldn’t it be awesome to open up your regular magazines (speaking hypothetically) and find something about it? Nobody is proposing that Discover, Scientific American, or its ilk will be replaced by articles in magazines, either. I’m just in favor of making the pie as huge as possible. Inherent in what I am interested in seeing in historically “women’s” magazines and blogs sites is “accidental” science…interesting science presented in these venues that attract women who might *not* seek out Scientific American or Discover. Why should science be dichotomized out of “women’s” publications? Men’s magazines include it–sometimes frivolously, sometimes quite seriously. My personal experience has been that women I know who are the demographic for these historically women-targeting publications *are* interested in science, but not to the point that they would pay for an entire magazine’s worth of it. But what about a department, section, or menu choice online? Many women who would never invest in a subscription to Sci Am or Discovery might stop at a science story that’s fascinating or folds in something of interest to their lives. Add to that, I am a woman, a mother who works from home and homeschools, and a scientist, and I’m not alone. Why do “women’s” magazines exclude women like me? Just so we’ll go buy Discover? Curious about why it would be a “mistake” to include some science of interest specifically to women in women’s magazines? Why would inclusion of interesting and relevant material be a “mistake”? As a freelance writer who often writes for newspapers, I think I can answer this one. That doesn’t mean I agree with the policy. The astrology sections are all syndicated. That means the newspapers and magazines pay for them as “filler” at a fraction of the price they would have to pay a writer if that space were used for another story. It really seems to be pure economics.